The recent death of Billy Graham signalled the end of an era—an era of both evangelicalism and evangelism. In this age of scepticism, it’s hard to imagine hearing the MCG once again echo those immortal words, ‘The Bible says…’ In this new era, how will we commend the gospel to a world no longer listening? 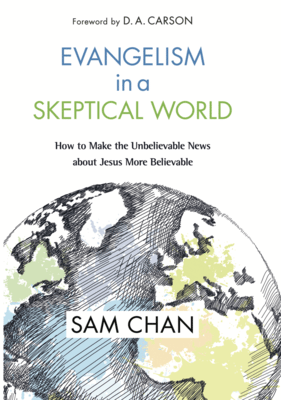 In Evangelism in a Skeptical World, Sam Chan presents a theology and practice of evangelism that speaks into our post-Christian, post-church, and post-reached world. He summons us to draw from the full breadth of biblical imagery to present the gospel clearly and compellingly. As a first-rate theologian, Sam writes with depth and erudition, drawing insights from biblical and systematic theologies. As a public evangelist with City Bible Forum, he writes with extensive experience and first-hand interaction with secular culture. Few people are better placed than Sam to write this book, which elegantly integrates sound biblical theology with strikingly accurate cultural insights. This book is a fine example of John Stott’s “double listening”, with one ear to the Bible and the other to the modern world. Sam begins by defining evangelism by its message, the evangel. Evangelism is “an event where the gospel is communicated” but “there is no single method of communicating the gospel” (17). In chapter 2, Sam offers six strategies for everyday evangelism, which acknowledge the plausibility structures, worldviews and social dynamics of post-Enlightenment Western society. Chapters 3-6 consider the relationship between Christ and culture, and propose a form of faithful and effective engagement. While Sam writes from a reformed evangelical perspective, there is no hint of crustiness or defensiveness that occasionally marks some contributions from these quarters. Instead, his speech is conversational and winsome; his posture charitable and empathetic. Sam models the tenor which ought to characterise our evangelistic interactions. The final chapters provide a framework for preparing evangelistic talks whether through storytelling or an expository or topical address. The book concludes with a brief consideration of apologetics that charts a middle course between presuppositional and evidentialist approaches. Our world is changing. Many of the cultural categories with which the West has been familiar are breaking down. And the gospel metaphors which correspond to those categories are losing resonance. But Sam presents the breadth of biblical imagery available to us; he lays out the myriad gospel metaphors in the Bible which form a cluster of theological concepts. Many of us default to categories of God as king, sin as rebellion, and the response as repentance. While these categories are right and biblical, they no longer engage our culture at the emotional and existential level. Sin is rebellion, but the Bible also describes it as idolatry, impurity, transgression and brokenness. Sam writes, “the Bible gives us different ways of explaining it to different audiences and different people” (65). Our task is to understand the cultural worldview and choose a gospel presentation that “scratches where they itch” (63). As an Asian-Australian, I particularly appreciated Sam’s exploration of shame and dishonour as a model of sin. I wonder how we might present the gospel using categories of pleasure and pain, a paradigm identified by David Williams at St Andrew’s Hall. In a pleasure-pain worldview, sin might be the tempting pleasure of the forbidden fruit (Gen 3:1-5) and the consequence, universal pain in the curse (Gen 3:14-19). In this paradigm, sin brings short-term pleasure but ultimately is a form of self-harm. …they are not alternative explanations of the cross, providing us with a range to choose from, but complementary to one another, each contributing a vital part to the whole’ (The Cross of Christ, 196). Indeed, extracting one of these images risks omitting key aspects of others. For example, if sin is only described as brokenness, there is no sense of moral responsibility and no need for repentance. However, Sam cannot be accused of this. He effectively grounds the myriad biblical metaphors in three fundamental manifestations of sin: vertical against God, horizontal against others, and internal against self. In doing so, he effectively guards against any false theological antitheses which force artificial binary distinctions. Hence his belief that we can “cautiously appropriate the language of brokenness for our evangelism” (80). Importantly, Sam describes these images as “emotional, existential and cultural points of entry” (99). They are our starting not our ending point. We need not and cannot say everything in one conversation. Graham Cole writes that substitution “may not have been our entry point into coming to understand the significance of the cross…but it needs to be the ending point” (God the Peacemaker, 238). Sam’s proposal appreciates the practical part of practical theology. We need not and cannot say everything in one conversation. Chapter 5 on “Contextualisation for Evangelism” may be one of the best practical analyses of Christ and culture I have read. Sam makes the point that both we as the evangelist and our audience are enculturated, and the gospel itself is both transcultural and enculturated. That is, it is both true for all cultures and at the same time expressed deeply in culture and with cultural categories. Evangelism therefore demands contextualisation with all of its attendant risks. Many pastors and evangelists are alive to the dangers of overadaptaion: syncretism, in which “you enter but don’t challenge the culture”. So we swing the pendulum and play it safe—we underadapt and “just stick to the gospel” (140)—or so we think! The problem is, “there is no form of presenting the gospel that hovers above a culture” (138). As a consequence, we end up imposing our default cultural expression of the gospel, all the while mistaking it for a “pure gospel”. Sam highlights: “The opposite of syncretism isn’t the pure gospel. The opposite of syncretism is legalism” (140). We win people for the gospel and our cultural norms. These insights hold up a mirror to our cultural biases and presuppositions. They reveal the assumptions which underlie our evangelistic preferences and theological emphases. They give us cause to re-evaluate their effectiveness in this post-Christian world. Sitting somewhere between overadaptation and underadaptation is the sweet spot of “critical contextualisation” in which “you enter and challenge the culture” (141). Chapter 6 is all about hitting that sweet spot and provides an effective three-step process of gospel-centred hermeneutics. This book is practical theology at its finest: deeply informed by Scripture and intimately connected with culture. It elegantly integrates insights from biblical studies, systematic theology, missiology and cultural analysis. This makes the book ideal for a broad range of readers. Evangelists and church planters will particularly benefit from the application of gospel metaphors to cultural worldviews. Indeed, as we plant a church to reach the Asian-Australian subcultures in south-east Melbourne, our core team will be reading this book. The later chapters on storytelling and preaching evangelistically are ideal aids for pastors and preachers. And the six strategies for everyday evangelism (Chapter 2) should be compulsory reading for every Christian!